Hackensack Meridian Health has been honored as a Champion of Good Works by The Commerce and Industry Association of New Jersey (CIANJ), for forming an innovate partnership with the Montclair State PSE&G Sustainability Institute, collaborating to offer the only hospital-based Green Team of college students in New Jersey. Embedded over the summer at The Deirdre Imus Environmental Health Center® at Hackensack University Medical Center, students helped to drive engagement in environmental initiatives. (Pictured left to right): Nadine D’Ambrosio manager, business development, The Deirdre Imus Environmental Health Center®, Erin Ihde, project manager, environmental research, The Deirdre Imus Environmental Health Center®, Kathleen Alexander, treasurer of CIANJ’s Board of Directors, Bonnie Eskenazi, managing director, The Deirdre Imus Environmental Health Center®, James Ronchi, project manager, Greening The Cleaning®, The Deirdre Imus Environmental Health Center®. 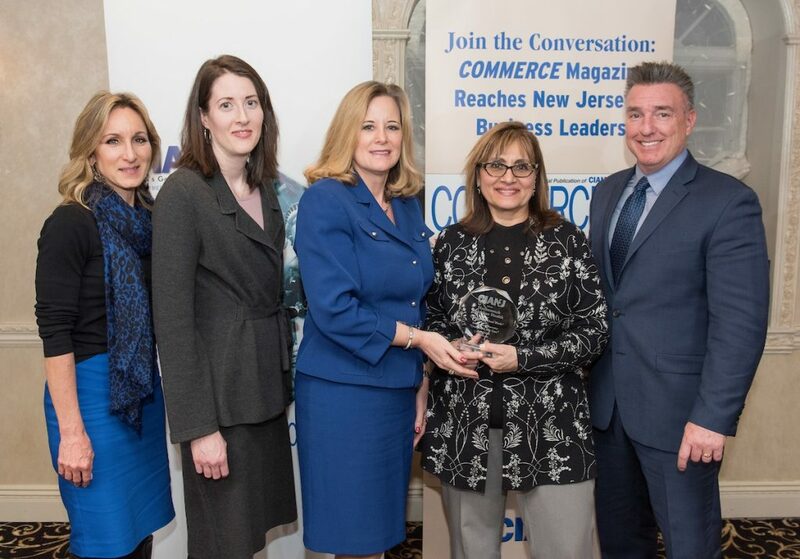 Hackensack Meridian Health is pleased to announce that it has been honored as a Champion of Good Works by The Commerce and Industry Association of New Jersey (CIANJ) for its work to support and advance environmental conservation. Hackensack Meridian Health was recognized for forming an innovate partnership with the Montclair State PSE&G Sustainability Institute, collaborating to offer the only hospital-based Green Team of college students in New Jersey. Embedded over the summer at The Deirdre Imus Environmental Health Center® at Hackensack University Medical Center, students helped to drive engagement in environmental initiatives. The CIANJ and COMMERCE Magazine recently hosted their Fifth Annual Chairman’s Reception – paying tribute to the kindness and generosity of the business community. Thirty-nine companies, including leading manufacturers, retailers, hospitals, banks and colleges and universities, were honored as Champions of Good Works. CIANJ asked the business community to share stories of its philanthropy. This year’s champions were determined by a blue-ribbon panel of judges. Their stories were featured in a special section of the March issue of COMMERCE Magazine. The Deirdre Imus Environmental Health Center® at Hackensack Meridian Health Hackensack University Medical Center represents one of the first hospital-based programs whose mission is to identify, control and ultimately prevent toxic exposures in the environment that threaten our children’s health. Since 2001, the Center has helped Hackensack University Medical Center become one of the first hospitals in the country to implement green cleaning practices, which was just the beginning of their sustainable journey. Since then, the Center helped the hospital reduce waste, minimize the use of hazardous materials, limit patient and employee exposure to dangerous toxins, prevent pollution, serve healthier foods, and more. Hackensack Meridian Health is a leading not-for-profit health care organization that is the most comprehensive and truly integrated health care network in New Jersey, offering a complete range of medical services, innovative research and life-enhancing care. Hackensack Meridian Health comprises 16 hospitals from Bergen to Ocean counties, which includes three academic medical centers – Hackensack University Medical Center in Hackensack, Jersey Shore University Medical Center in Neptune, JFK Medical Center in Edison; two children’s hospitals – Joseph M. Sanzari Children’s Hospital in Hackensack, K. Hovnanian Children’s Hospital in Neptune; 11 community hospitals – Ocean Medical Center in Brick, Riverview Medical Center in Red Bank, Mountainside Medical Center in Montclair, Palisades Medical Center in North Bergen, Raritan Bay Medical Center in Perth Amboy, Southern Ocean Medical Center in Manahawkin, Bayshore Medical Center in Holmdel, Raritan Bay Medical Center in Old Bridge, and Pascack Valley Medical Center in Westwood, JFK Johnson Rehabilitation Institute in Edison and Shore Rehabilitation Institute in Brick. The network’s notable distinctions include having one of only five major academic medical centers in the nation to receive Healthgrades America’s 50 Best Hospitals Award for five or more consecutive years, four hospitals among the top 10 in New Jersey, including Hackensack University Medical Center which is ranked No. 1 by U.S. News and World Report. Other honors include consistently achieving Magnet® recognition for nursing excellence from the American Nurses Credentialing Center, recipient of the John M. Eisenberg Award for Patient Safety and Quality from The Joint Commission and the National Quality Forum, a six-time recipient of Fortune’s “100 Best Companies to Work For,” one of the “20 Best Workplaces in Health Care” in the nation, and the number one “Best Place to Work for Women.” Hackensack Meridian Health is a member of AllSpire Health Partners, an interstate consortium of leading health systems, to focus on the sharing of best practices in clinical care and achieving efficiencies.